Great Eastern teamed up with SPHMBO on an out-of-home campaign featuring Instagram contest winners for its #RetireGreat campaign along with their heart-warming retirement dreams. The campaign provides a glimpse of how to achieve a great retirement through Great Eastern’s suite of retirement solutions. 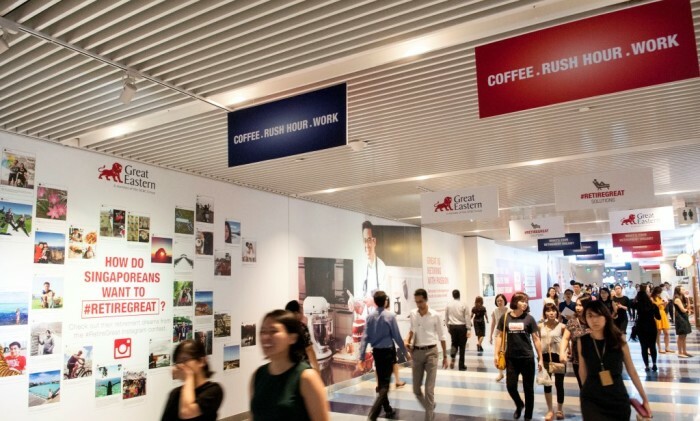 It dresses up the walls at the Ocean Financial Centre linkway to showcase the selected winners, along with a digital wall mural. The digital wall showcases how the winners have an opportunity to live out a slice of their retirement dreams supported by Great Eastern and sharing of tips to spur consumers on their thoughts for their retirement. “With this campaign, using real-life stories and heart-warming aspirations, we hope to spur consumers to start planning early for their retirement. At Great Eastern, we have a comprehensive suite of holistic retirement solutions. Recognising the growing trend of consumers spending more time assessing content on-the-go, our campaign focused on reaching out to them through online as well as outdoor media platforms.” Colin Chan, chief marketing officer of Great Eastern Life Assurance said. “With the explosion of big data and new technologies, it is critical to build a talent pool of market researchers who can draw mea..